How much does it cost to travel to Orlando? How much money will you need in Orlando? $241 is the average daily price for traveling in Orlando. The average price of food for one day is $50. The average price of a hotel for a couple is $225. Additional pricing is in the table below. These average travel prices have been collected from other travelers to help you plan your own travel budget. How much money do I need for Orlando? Orlando is a haven for tourists from the entire United States and abroad. The most famous sight in Orlando, Walt Disney World, is not actually located in the city at all, but in nearby Lake Buena Vista. The area attracts over 50 million visitors a year and the city's sprawling development has created amenities and entertainment options for tourists of all ages. The climate in Orlando is typical of the rest of Florida. It is quite hot and humid in the summer and cooler but comfortable in the winter. It is not unusual for there to be one or two weeks each winter when the weather is uncomfortably cold. Because of the city's extreme popularity as a vacation destination for families, you should time your visit around school and holiday schedules in addition to the weather. Holidays such as spring break and summer vacation can be quite crowded and make for an uncomfortable trip. Prices can also climb significantly higher during these times. It is best to avoid these peak times if at all possible. Orlando really is about theme parks. It's the home of Walt Disney World, Universal Studios, and Seaworld among many others. It has long been the fantasy destination for many children. The largest, and most famous theme park in Orlando is Walt Disney World which has several parks in its system including the Magic Kingdom, Epcot Center, and Animal Kingdom. It also has many hotels and restaurants over a range of costs and quality levels. In addition to the many hotels, there is a campground, located on the Disney grounds as well. Many visitors to Disney World purchase a package vacation that includes a hotel stay, some meals, and admission to a variety of the theme parks. Although at first appearance it may appear that Disney's package deals are there best option, it is actually cheaper to stay outside of the theme park in many situations. There are some very discount hotel options around, many of which offer a shuttle to the parks. You can still purchase theme park tickets as a multi day set for a discounted rate, and you will not have to pay the marked up price for the Disney hotel. Recently, Disney also changed their rules regarding food in their theme parks. You are now allowed to pack your own lunch and carry it into the park. This can dramatically cut down on costs for food, particularly if you are traveling with a large family. 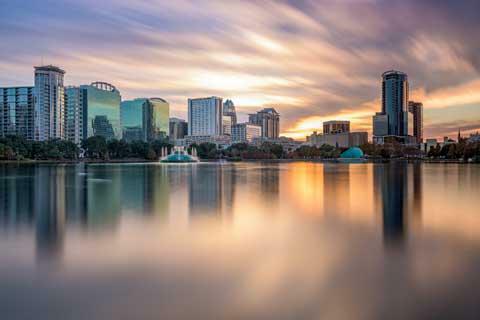 Orlando and the surrounding suburbs make up a sprawling metropolitan area. Most visitors come for the theme parks, which are located outside of the city proper. International Drive is one of the main tourist drags. It's a major road that is lined with cheap hotels, outlet malls and restaurants. On the south end you'll find Sea World and the Orange County Convention Center. Downtown Orlando has undergone a recent revitalization. There are many new condos and a young urban population. There are also many bars, clubs and restaurants that are worth visiting. In addition to Orlando, the metropolitan area also includes the cities of Altamonte Springs, Davenport, Kissimmee and Winter Park. Kissimmee is where you'll find Walt Disney World. The western side has cheap hotels that appeal to tourists. The Disney designed town of Celebration is also close by and worth a visit. In addition to visiting any of the many theme parks around Orlando and the surrounding areas, there are many other entertainment options that appeal to adults and kids alike. Popular activities include golf, tennis, shopping, or attending a sporting event such as an Orlando Magic game. There are several areas in Orlando that offer a high concentration of restaurants for visitors. CityWalk at Universal Orlando is a great option. There you will find Margaritaville, Hard Rock Cafe, Pastamore, NASCAR Cafe among other options. You do have to pay for parking ($14 during the day and $5 after 6PM except during certain times). Downtown Disney also has a variety of options such as Rainforest Cafe, Planet Hollywood, and Wolfgang Puck Cafe. Disney's Epcot Center offer's a variety of international dining options within the park. Favorites include the Moroccan restaurant and the Canadian steakhouse. If you're looking for something a little different, head to downtown Orlando. There you'll find some of the city's best restaurants with options including French, Italian, Chinese and Japanese. It is possible to travel in Orlando without a car, particularly if you stay within the Disney grounds. If you hope to visit any other theme parks however, it can be far less efficient without a vehicle. The city is known for its sprawling development and most of the area's attractions are located far from each other or the downtown part of the city. Many are in nearby cities such as Kissimmee and Lake Buena Vista. Driving is relatively easy and the roads are of great quality. Traffic congestion can be high during the holiday seasons or when parks are first opening or closing. Road construction projects are also not uncommon. It is very easy and relatively affordable to rent a car in Orlando. Arranging the vehicle in advance will offer you the best rates. All of the major rental companies are available including Alamo, Avis, Budget, Dollar, Enterprise, E-Z Rent-A-Car, National, and Thrifty. Taxis are available from any of the dozens of taxi companies located in the city. It's relatively easy to find a taxi from the airport to your hotel or from you hotel to a theme park. Prices, however, can be quite expensive. If you plan to be in town for any significant amount of time then this option is less convenient than renting a vehicle. Consider staying outside of the Disney World complex when traveling to Orlando. There are discount hotels that can run as cheap as $40 a night within a couple of miles of the park. You might miss out on a little of the Disney ambiance, but after a full day wandering the park, a break might be necessary.